More Heat. More Air. Less Money. From top to bottom, our ovens are designed specifically for powder coating. We have spent years researching, refining and updating our equipment to provide coating specialists with the appliances they need to produce a high-quality, long lasting powder finish. Our equipment is built with efficiency and durability in mind, using high-quality components that never compromise quality and performance. We use state-of-the-art burner technology that gets the air to temperature faster – which saves you times every day. It uses less fuel, which saves on your operating costs. Our 6″ wall panels use bolt-together construction which makes for a more solid, more stable device. We use genuine Rockwool brand high-density mineral wool insulation that keeps the heat in the coating oven cabin and out of your work space. And the entire design is heat efficient and built to create optimal airflow throughout the powder coating oven enclosure, preventing hot spots and providing an even, constant cure for your parts. Standard and custom sizes range from small walk-in units to large heavy equipment industrial ovens and conveyorized curing systems. Standard batch sizes ranging from 6’H x 6’W interior working dimensions to 12’H x 12’W interior working dimensions available, standard lengths up to 50′. Options include custom frontal/doors, conveyor or cart system integration, client specified layouts, and custom controls. Custom burner configurations available. 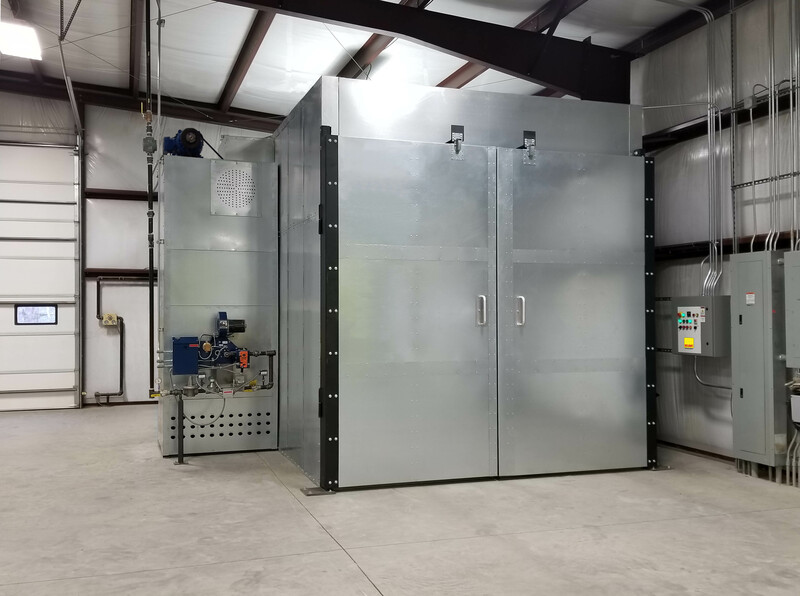 All our powder coat ovens feature premium 6″ thick insulated wall and roof panels and are available in pre-heat, drying, curing, or multi-function designs. The oven walls, ceiling and roof are made of 20 gauge or thicker G90 galvanized steel or aluminized components. The oven utilizes a double panel design. The interior walls and roof are formed into 6” panels to receive factory-supplied insulation. Mineral wool insulation of at least 6# density is inserted between these inner panels and the external skins during installation. The main oven enclosure components are bolted together, typically on 6” centers. Threaded inserts in key parts help simplify assembly. When using roof mounted heat units or double load-in frontals, the ovens are equipped with support beams to increase rigidity. No welding is required. Door thickness is included in the overall dimensions cited for the oven cabin. The oven doors are typically a 5” or thicker composite design made of 11, 16, 18, and 20 gauge components that house mineral wool insulation of not less than 6# density. The doors feature a rigid internal steel frame and are designed so they don’t warp over time due to heat. Durable fiberglass gasket material is included. The doors have a snug fit against the supplied gasket, but are very easy to open and close. The doors keep heat in, but still give smooth, adjustment-free operation without the need for floor casters or locking latch rods. Friction latches, often known as “panic latches” or “slam latches,” enable the doors to be opened from the inside in an emergency, and they also serve to safely vent excessive positive pressure from the oven enclosure. The heat unit is constructed of primarily 11 gauge, 16 gauge and 18 gauge aluminized or G90 galvanized steel components with mineral wool insulation of at least 6# density used throughout the assembly. The heat system utilizes an ETL-listed Power Flame “Jet Fire” forced-induction burner with an integrated combustion supply fan. The heat unit’s combustion chamber features a stainless steel splash plate. The heat unit adjusts “on the fly” in response to the control panel’s PID fuzzy logic controller. The heat unit enclosure includes a dual-inlet/dual-outlet forward curving fan wheel to cycle the heated air through the oven enclosure. The heat unit features an oversize fan shaft for durability and reduced vibration, as well as special high-temperature bearing assemblies that are easily accessible. Each unit is optimized for premium results at the customer’s location and shipped with a fan performance graph. The heat unit and exhaust are controlled via a remote control panel in a NEMA enclosure. The control panel allows the operator to see a digital display of the heat unit’s output air temperature and adjust the unit accordingly. The control panel includes a variety of safety devices, including audible and visual alarms. The control system uses a variable frequency device (VFD) to adjust the atmosphere inside the oven by fine-tuning the performance of the exhaust fan. A high-performance ventilation fan assembly is mounted on-site to the shop floor using anti vibration bushings. The assembly uses a backwards-inclined fan mated to a motor drive via a belt system. The fan intake extends through a special wall skin and special wall panel. The exhaust drive components are housed in a ventilated steel enclosure. This system requires the use of 8” I.D. Double-wall (Type B) exhaust ducting with a high-flow exhaust cap that prevents the intrusion of water. Exhaust duct, duct mounting adapters, combustion supply fan intake duct, gas piping to the gas train, gas valve ventilation piping, parts for electrical service connection to the control panel, and field wiring components are provided by other companies and are not considered part of the deliverable. Reliant powder coating equipment delivers unassembled. Reliant has hundreds of finishing systems in operation around the world successfully installed by our clients, but we know that some of our clients need to be up and running as quickly as possible. Our factory-authorized installation crews can have your equipment up and running much faster – typically 3-6 weeks faster than an untrained crew. If your project is time sensitive or you need to be up and operational with minimal hassle, we urge you to consider using a Reliant crew when you purchase your powder coating equipment. Adaptable for use with cart track, overhead monorail conveyor, specialized racks, etc.